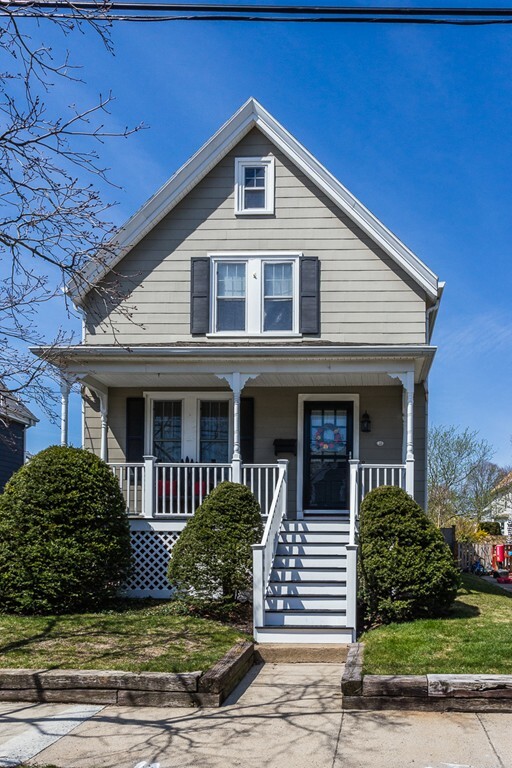 Sweet 7 Room Colonial in beloved neighborhood near Clarke Elementary School, King's Beach and moments to all that downtown offers! The floor plan on first floor includes a well-designed, updated kitchen that is open to the dining room with gas cooking, corian counters and island with seating for 4. The first floor family room, with tucked-away half bath, leads to a great oversized deck and pretty, flat yard. 3 well-sized bedrooms. Period details include Bulls-eye moldings, crown moldings, corner cabinet in the dining room and high ceilings. The closet space on 2nd floor is plentiful. Ideal location for commuters--leave your car at home--Train station is less than half a mile away! Storage space throughout is abundant--full basement, attic, closets and shed in the yard. can view in 3rd bedroom.